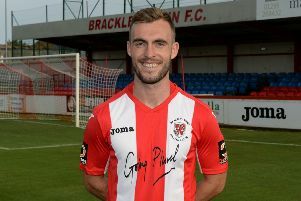 Brackley Town remain outside the Vanarama National League North drop zone - just - after another stalemate. This time it came at Whaddon Road against Gloucester City where neither side did enough to warrant the three points. Both teams both deserved their point as weary limbs ran and competed until the last in an encounter that was absorbing but rarely set the pulse racing. The hard won point may yet prove vital for Saints come the final reckoning. Saints enjoyed the better of the first half hour with the Tigers finishing the first half more strongly. The second period was evenly contested, a reflection on the travails of both sides, and a far easier prediction for punters on Grand National day given City are the division’s lowest scorers while Saints are the third lowest. David Moyo was at the centre of the two key moments of the first period. Through on goal after just five minutes, Moyo beat keeper Jasbir Singh and fired towards an unguarded net but defender Sam Avery somehow got back to clear the ball off the line. Then Singh clearly handled the ball outside the penalty area to deny Moyo who was again through on goal, an incident mysteriously missed by the officials much to the visitors’ dismay. Ben Tilney tested Singh from distance to win a corner and City’s Luke Hopper wriggled through only to be denied by Sam Hornby on the stroke of halftime. Both sides had chances to break the deadlock but wayward finishing rarely brought Hornby or Singh into serious action. Moyo touched Stefan Morley’s cross just wide of the post and failed to steer Tom Winters’ pin-point cross on target. For City, Hopper was twice denied from close range and only a fine block tackle by Luke Graham kept Joe Hanks at bay late in the game.